Have you ever wished you could pick up the phone and ask Dr. Beechick your homeschooling question? This question-and-answer format is almost like that phone call. Editor Debbie Strayer selected the questions most asked of Dr. Beechick at conventions and in her magazine column. She organized and indexed thoroughly so you can find Beechick's comments on all these important topics. One chapter contains questions on high school, which comprises Beechick's first major message to homeschooling families of high schoolers. Find the famous common sense help on every page of this practical book. Have you ever wished you could pick up the phone and ask Dr. Beechick your homeschooling question? This question-and-answer format is almost like that phone call. Editor Debbie Strayer selected the questions most asked of Dr. Beechick at conventions and in her magazine column. She organized and indexed thoroughly so you can find Beechick's comments on all these important topics. 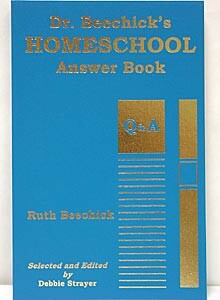 One chapter contains questions on high school, which comprises Beechick's first major message to homeschooling families of high schoolers. Find the famous common sense help on every page of this practical book.